This encouraged me to do some research and the results I found was pretty good. It turns out that Lord of the Rings: The Third Age (my favourite game on the Playstation 2) was also released for the Gamecube. I don’t know if this version is better or worse than the one for the Playstation, but I think it looks quite similar after watching some in-game footage on YouTube. I’m definitely going to buy this game though, so that I can get my LOTR fix on the Wii. Have any of you tried running Gamecube games on the Wii by the way? If yes, what are your experiences? Did it work out well? My nephew has a Wii, the only thing we play on it is the old games you can download from their store. There are some other cool games, but since we both have 360’s we mostly play the games on that. Thanks for your comment. 🙂 I can understand that. There are quite a lot of nice games for the 360. Which Nintendo-classics do you play? The Donkey Kong games perhaps? Those are awesome. I also have the game cube game Zelda Four Swords which is awesome because I also own 4x GBA-SP consoles and I have the adapter for them to plug into the GBA and into the Wii for the Zelda Four Swords game so for example when you enter caves etc you end up playing on the GBA screens like climbing up and down ladders and behind water falls etc, very cool idea. I also have cable extensions on all game cube controllers and the adapters for the GBA so I can sit anywhere, since everything is set up in my cinema room I need long cables haha. I am also a collector of games and consoles, I have almost a total of 30 consoles all complete with Boxes and manuals etc, some or rare limited edition consoles. 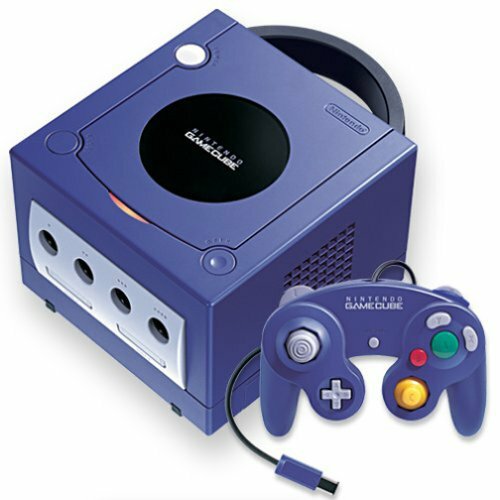 I will most likely buy another Game Cube just for collection. I am currently sources more consoles so I will add to them soon, I only buy complete and in mint condition if possible and or limited edition. You can see my Youtube video tour down below, see links. For some reason my video came out squashed looking so if you see the pic above you will see the dfifference. There are 2 parts, 1st part I show off 2 HD tvs and then the dedicated cinema room, the 2nd video I show some of my gaming consoles but that is not even half of it, I plan to do another video since I have like 20 other consoles not yet in the video, such as, NES, SNES, Megadrive, Limited Edition Japanese DreamCast, Limited Edition Final Fantasy WonderSwan Color, and Wonderswan B&W, Xbox 1 and Sega Game Gear, Limited Edition game boy color and 2x mint condition Amiga 500 which are the only ones I don’t have a box for 😦 but they are in awesome condition, still new looking white, not faded yellow that you see out there and lots more consoles and games all complete with boxes etc. Wow, those videos are amazing, especially the first one. You’ve got an awesome game room there.. so much great stuff! Must be fun to play games on such a large screen with decent sound. Must have costed a fortune to get hold of all those goodies. 😀 Really loved the Toshiba-light as well. I see you’ve got the complete season of Friends there and you pointed out that it was limited edition with longer episodes. I’ve never seen the extended episodes before. How much longer are these episodes in general? A couple of minutes or more? I’d be interested in checking them out, as I love Friends. Thanks for checking out the video, yeah I have spent alot in it all but it didn’t happen over night. Watching movies and playing video games all on the big screen is awesome. Even the Amiga on the big screen shows up nicely. I am working on a seperate retro gaming room which will take a bit of time to set up as i’m in the middle of millions of other plans but I got a few consoles to start with so it is just a matter of getting hold of some cabinets to display them all in. Yes, the Friends tv show is a great show and can’t wait until it comes to Bluray, which I am hoping will have the extended versions on it, but I will never sell the dvd collection for 2 reasons, one being limited edition and complete and the other reason incase the Bluray versions will be standard length. To give you an idea of total running time of the Friends show, the normal everyday standard dvd version running time for season one goes for 562 mins, the total run time for the extended edition I have goes for 587, which is 25 minutes longer in total, so one episode might be 2 minutes longet another could be 4 but in different parts of the show of course not just one section. I know they have to cut the show to air on tv etc, but there is no reason in the world why they should cut it for dvd, the good thing is which again don’t understand why they cut it in the standard dvd but the parts they put back in the limited edition were all very funny parts and even made the complete scenes more funny and had a better story to them. Even now if you get a chance to watch them and seeing the new parts for the first time I promise you will laugh at all of them and you will think why in the hell would they cut that out. If you have seen the entire show of friends heaps of times before you will know exactly what the new parts are. You can still buy the limited edition dvd’s on Amazon.com etc and they are pretty cheap. If you like friends I urge you to buy this collection, it’s kinda like watching a new series because its new and lasts longer and its even more funny to watch. Also each DVD has all the bloopers for each of the seasons. A retro gaming room sounds interesting. Always dreamt about some kind of game room myself. If we get enough cash to purchase a bigger place, then it might become a reality, but I guess that is a bit ahead in the future. 😉 Time will show. Thanks for the information on the Friends series. I’ve seen all episodes, so I believe I’ll be able to spot the difference. Definitely going to check it out. Thanks for the heads-up! I have always wanted a game room for as long as I can remember, the same with the cinema room. The layout of my new house had everything I could possibly need to do what I would like with of course a few minor changes of my own design such, Just finished getting built in July 2011 so only been here a few months now and loving it, There is a dedicated cinema room which was great (techinically a second lounge) but who wants 2 lounge rooms haha but it was a room all on its own with two double doors so it made sense to use this as a cinema room. It’s a 5 bedroom house so I can use one of the other rooms for a retro gaming room. I plan to do some sort of cinema setup in the lounge also eventually, there are 2 out door living areas 1 being under the roof line which will be all closed up with a pool table and tvs on the wall etc but I am in no hurry for this as for all the plans I have in place is going to cost me a few bob lol, but the design of everything is there already so it just a matter of when and what to do etc. So don’t expect a video of the actual finished retro room yet, I dare say it won’t even be this year as i am still collecting some consoles and sorting other stuff etc, but I have planned to do a video of the consoles on their own but not sure when exactly. Sounds awesome. 🙂 Have you made any new videos of your place btw? I’d forgotten all about this little fact about the Wii! No problem, mate. 🙂 What kind of game is Viewtiful Joe? Thanks, Smuggsy. 🙂 Will have a look at that video right now.